So I sign up for the test day today. Only 3 days until the race! I get to the track early but only sign up for the afternoon since the track is totally fogged in and they are not letting cars out yet anyway. I get down to the paddock. There aren’t many cars there but what do i see? I can’t believe my luck. 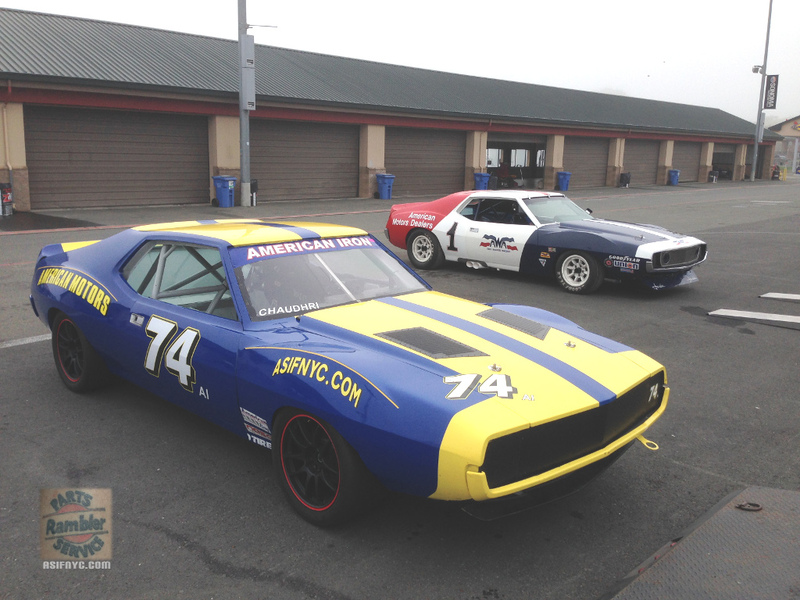 There is a Trans-Am Javelin ready for testing! I was so bummed when I didn’t get to run with the TA cars at the first test and now I was going to get another chance :). What was even cooler was its a TA Javelin that I’ve been around the least. This is the #1 Roy Woods Racing Javelin. Sister car to the #2 car Ken Epsman owns. Got to park right next to them and got some cool shots of my car with the real McCoy in the background. I’ve been around Ken’s #2 car a lot over the years (since it lives at Sonoma) and the #6 a few times as well but I’ve only seen this car once before. It was in the 90’s. I was still living in NY and went to a vintage race at Watkins Glen. Anyway, this car is now in the bay area as well! I talked to the guy that worked on the car and he said they were only signed up for the morning and that the owner would probably only do about 5 laps. Ah crap… so once again I won’t be on track with them 🙁 Anyway, we waited for the fog to clear. Took a while but they finally opened the track. The #1 Javelin went out and sure enough 5 laps later he was done. The car is going to be driven at a vintage event at Laguna Seca this summer and he just wanted to make sure everything was working. It was so they loaded up. My second near miss of getting to run with a real TA car. 1pm finally came around and I headed on track. I start accelerating up the hill just waiting for the oscillation to start. Thankfully it didnt. So I make the turn and accelerate again to turn 3. Still no problem. Then I start braking for 3 and the steering wheel starts shaking pretty Bad. Ugh! What the hell is wrong with this car? I keep going and the shimmy under braking is pretty constant. I can drive the car but if I do more than lightly drag the brakes I get the shimmy. I keep doing laps hoping it will somehow get better. It doesn’t but it also doesn’t seem to get worse so I keep going. Finally after about 12 laps I get down to a 2:02. I don’t really think I can do any better with the way the car is behaving so I call it a day. Remember, my best time before the lowering and other mods was a 1:57. So I’m pretty disappointed. So that’s it. Just 3 days until the race weekend starts. First race for the Javelin since 2012! I’m just going to go out there and make laps and hope I can get better. Unfortunately, the Socal boys won’t be coming up. Don’t know if there will be any other American Iron cars or not. We’ll see. If I recall correctly, the “1971” #1 and #2 T/A Javelin AMXs are actually 1970 models that were re-skinned for 1971 when Penske sold the cars to Roy Woods. I think if you look closely, you can see some of the subtle cue’s from a 1970 on the inner panels, like the trunk shape and things like that. Either way, awesome piece of history and even cooler to see on the track, I’m sure!! !